*The author is very indebted to Esso Standard, Société Anonyme Française, for a predoctoral fellowship. Several different expressions for the Goos–Hänchen shift have been given in the literature. By looking at the problem from the point of view of the conservation of energy, new and more accurate expressions can be derived. 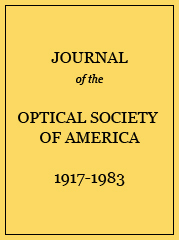 For light waves, classical optics is used; for waves associated with particles, a quantum-mechanical approach is used. A comparison is made of the results of the present work with the earlier theories. Numerical comparison between experimental results and several theories. The quantities k⊥ and k∥ are related to the observed quantities d⊥ and d∥ by Eq. (12).